The BJP believes how PM Narendra Modi convinces voters that he is best equipped to defend the country will be key. New Delhi: The Bharatiya Janata Party (BJP) believes Thursday’s terror attack in Pulwama, Jammu & Kashmir, will be a “significant factor” in the upcoming Lok Sabha elections, but feels its impact on the party’s fortunes remains “unclear”. In a suicide attack Thursday, an explosives-laden SUV rammed into a CRPF convoy, killing at least 40 personnel. This is the biggest attack on security forces in the conflict-ridden Valley. According to two BJP sources, the party believes the potential impact of the terror attack on its performance will depend on the “government’s response” as well as how convincingly Prime Minister Narendra Modi is able to project himself as the leader who is “better equipped to defend” the country and punish the perpetrators. According to one of the sources, the “timing and magnitude” of the terror attack as well as the ensuing outrage mean it will end up being a determinant in the forthcoming Lok Sabha election, but how it will impact the ruling BJP remains to be seen. According to the sources, the BJP believes the deadly incident could well overshadow other issues that have so far dominated the discourse in the run-up to the polls. “It is unclear how it will impact us. It is too soon to be able to determine that,” said one of the sources. “But it will definitely be a significant factor. We are very conscious of that. The government’s response will be key. A thorough evaluation of various options available is needed and will be done,” the source added. “Whatever issues have been on top of the political discourse so far will now take a backseat, at least for a while,” the source said. “Our actions and what they yield, plus whether we are able to appear both sincere and capable of handling such heinous attacks, are all going to be very important,” the source added. In the 2009 Lok Sabha polls, the Congress-led United Progressive Alliance (UPA) government was voted back to power despite the Mumbai terror attacks, which took place in November 2008. “The Congress won after 26/11 perhaps because people trusted it over the other option when they felt insecure,” said the second source. “Voters also look at things from that perspective — who is better equipped to defend you,” said the source. Given the vulnerability of the moment, the BJP believes it is also imperative to convince voters that Modi’s leadership is best suited to protect the interests of the country and come down heavily against those who sponsor terror here. A glimpse of this was more than visible in the PM’s speeches at two events Friday. While both the events — to flag off the Vande Bharat Express in New Delhi as well as launch various development projects in Bundelkhand — were pre-decided, the PM made sure to open his speeches with a mention of the terror attack, raise the pitch, and spend considerable time to underscore his government’s aggression. “The sacrifice of our jawans will not go waste,” Modi said in Jhansi. “I want to give this assurance to 130 crore Indians from the land of the brave — Jhansi. The perpetrators of Pulwama and its conspirators will be punished. Our neighbouring country has forgotten this is an India of new policies and new customs,” he added. 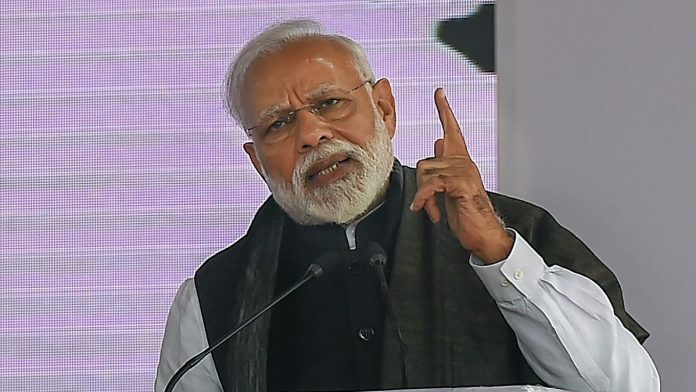 “Our defence forces have been given permission to decide the future course of action as well as its place and form,” Modi said, attempting to give out a clear and unequivocal message — both to Pakistan as well as voters. Earlier in the day, Modi had said the defence forces had been given “complete freedom”. In both his speeches, the PM made sure to mention Pakistan several times and how India would not take its “conspiracies” lying down, or allow such attacks to destabilise it. With the terror attack leading to complete outrage, the pressure to act has been building up on the Modi government, not just from outside, but from within as well. Rashtriya Swayamsevak Sangh (RSS) chief Mohan Bhagwat, for instance, said, “we expect action in response to this incident”. Several BJP MPs and leaders have also issued strong statements, claiming action will be taken. Perhaps something as deadly as the Pulwama attack should be taken above partisan politics completely. The Congress President is drawing praise, with Dr Singh by his side, in saying there will be no political conversation around this tragedy. That the entire opposition stands in solidarity with the armed forces and the government of the day. 2. Pakistan’s perfidies have outlasted several Indian governments. Kargil, the attack on Parliament, 26 / 11. While China is a greater threat in terms of magnitude, it is Pakistan with which the guns never fall silent. To say that one government is “ weal “, the other “ resolute “, may not be well received by citizens. All the more when the armed forces – our sword and shield, with some help from the intelligence services – are a national treasure, completely apolitical and neutral. On operational matters, subject to the political executive thinking through the diplomatic consequences, they have always enjoyed high autonomy. Here again, a binary of one administration empowering them, the other restraining or even emasculating their effectiveness, may not strike the right note with the public. The film Uri, with how is the Josh, seems trite now. 3. There are many substantial and peripheral issues on which the general election will be fought. Let our troubled relationship with Pakistan not become one of them. Reality in 2019 on the issue of national security is looking more granular than the electoral narrative of 2014. It would be a good idea to convene on all party meeting, share all that is feasible, take their sense and suggestions, work out, even at this belated stage, a rudimentary consensus on this issue. And ask the friendly channels to Shut up.